It’s almost a month now since I arrived in post as an RA here on the Burns C21 project. This seems an opportune moment to reflect on some of the interesting points that have arisen during this initial period. As the project moves towards our two publications of song, I am working closely with Dr. Kirsteen McCue on the material Burns contributed to George Thomson’s publications. One of my jobs so far has been to revisit the correspondence between Burns and Thomson, letters which grant an insight into the creative and editorial process that underpinned Thomson’s publications – something which our completed volume will look to address in depth. It is a complex picture as the men negotiate over the respective merits of airs, verses and settings, revealing a fluidity that Thomson’s publications would embody, given his practice of continually revising material. Indeed, as new and supposedly ‘traditional’ material is profoundly intermixed, this context nicely demonstrates the complexity of contemporary attitudes to authorship. Also fascinating is the power-balance between editor and poet, with Thomson never slow to offer his frank critiques. While Burns remains mostly affable on the subject, it is clear that on occasion Thomson oversteps the mark. There is also a significant ideological gap between the men and while some older criticism has risked caricaturing Thomson as an ‘improvement’-obsessed North Briton seeking to water down the vernacular riotousness of the bard, there is at times a clear tension around the national, political and sexual content of the material. Within this, the concept of ‘simplicity’ becomes a major site of contest, with the two holding potentially disparate views on what this should finally mean in the context of art. Telling is Thomson’s complaint that too many among the ‘legion of Scotish [sic] Poetasters’ have ‘mistaken vulgarity for simplicity’. What finally emerges is a nuanced relationship in which Burns had significant time for Thomson’s polite aims, which of course involved commissioning some of the leading European composers of the time, names like Haydn, Kozeluch and Beethoven. Furthermore, though the editor was indeed rigorous on the complicated subject of decency – with his volumes intended primarily for young ladies – there are some inconsistencies in this decorous outlook. That said, it’s difficult not to be amused at Thomson’s silences when Burns repeatedly sends him bawdry of the most unrestrained kind. Did Burns suspect that Thomson might secretly welcome it? Or was he simply enjoying the thought of the Edinburgh clerk’s discomfort? In the coming months we’ll also be trying our best to crack something of a longstanding mystery in the world of Burns scholarship, namely the whereabouts of Thomson’s original letters to Burns and family. It is well known that when James Currie came to publish the correspondence between Thomson and Burns, the ‘versions’ Thomson submitted of his own letters were at least tweaked, potentially quite substantially rewritten. This adds credence to the theory that he destroyed the originals. Yet, with newly rediscovered manuscripts surfacing on a regular basis, hope remains that these letters are lying neglected in a library or private collection somewhere. 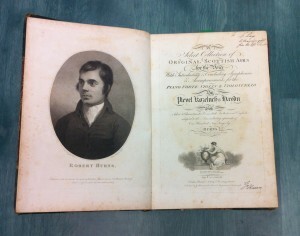 RT @GlasgowBurns: Read the first blog post from our newest colleague on Robert Burns C21, Dr Gerard Lee McKeever!